The next morning were were off for another 6 hour drive to the city of Bikaner, close to the Pakistan border. Mr Singh looked well rested (which is more than I can say for us) and the car, of course was immaculately clean. The roads in Mandawa were paved once, maybe back in 1940, but by the time we drove across them there were 10 gallon sized pot holes. Mr Singh managed to avoid a lot of them, but one finally got us. It was time to change a tire. Within minutes of removing our luggage from the trunk (to get the tire jack and spare) at least 20 locals crowded around us. We didn’t think they were going to take anything, they were just interested. It was pobably Gretchen’s blonde hair. Blondes are a real treat for the Rajasthani. At one point, a 10 year old boy forced his way to the front of the crowds and announced in his best english, “I am in school and I am studying to be an engineer. 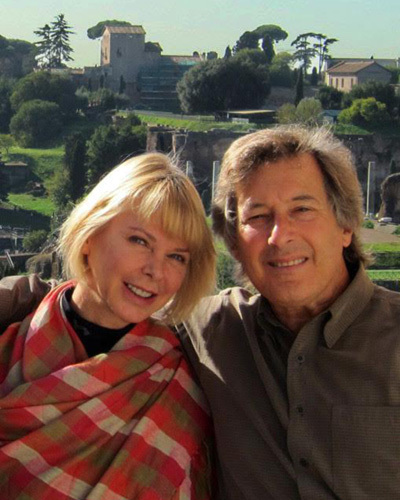 I speak good english.” Well told him how happy we were to meet him, but no one else understood what he was saying. Although english is taught in the schools, here in Mandawar, it pretty much rajasthani or hindi. Mr. Singh changed the tire by himself. He refused to let us help. A few kilometers outside of town we found a tire repair center (a very popular business in Rajasthan) and as they repaired the tire, we amused ourselves with an old beat up camel. We arrived to the Hotel Bhanwar Niwas in the late afternoon. It was a big step up from our accommodations in Mandawar. The Palace was built in 1927 and hasn’t changed muchsince then. The plumbing and (gigantic) bathrooms are upgraded but the rooms still have that early 20th century British colonial feel to them. It was too late to see the Fort and the Royal Palace, but after tossing our things into our room, Mr Singh got us back in the car and took us to a local camel farm. It was here, where we were introduced to ourlocal guide Mr Singh (not to be confused with our driver Mr Singh). Apparently the camels from Bikaner are renowned throughout India for their stregnth and speed. 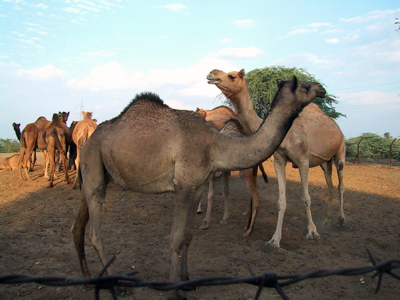 We had just missed the Camel fair in nearby Pushkar where Bikaner camels went for lots of money. 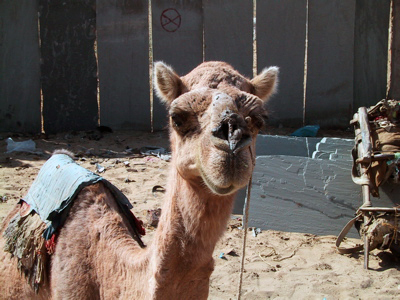 Yes, there is still a very big market for camels in this part of the country. 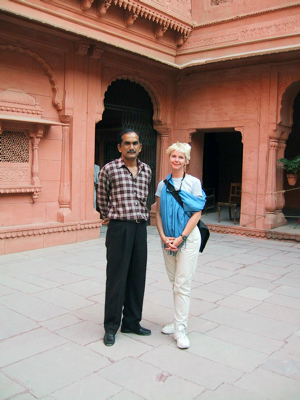 The following morning, Mr Singh (our driver) brought us to meet Mr Singh, our guide at the 16th century Mughal fortress, Junagarh Fort, an immense red sandstone Fortress with 37 palaces, temples and pavilions. The carved windows are spectacular. Large metal spikes are still mounted to the main doors of the Sun Gate. If an oncoming elephant bull tried to ram the door, these strategically placed spikes would pierce through the head of the attacking beast. The Fort was only overtaken once but the possession changed back in in less than 24hrs. We also made a brief stop at the Lalgarh Palace. 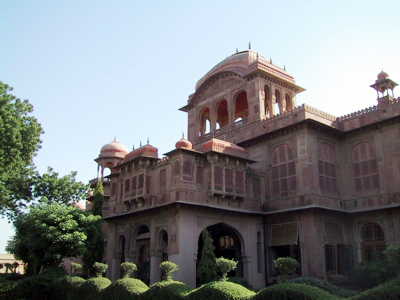 The red sandstone Maharaja Palace built in 1902 has 38 rooms filled with antiques, hunting trophies and Rajastani paintings. Like many of the Maharaja Places in Rajastan, this one has also converted over to hotel status and is managed the the Heritage Hotel Group.